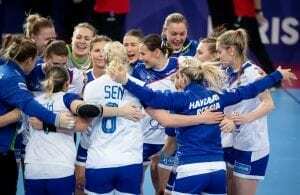 The Russian champions have secured their second consecutive participation on the Delo Women’s EHF Final 4 after defeating FTC Rail Cargo Hungaria by 33-22 on the second leg of the quarter finals. The first leg had finished with a +3 (26-29) on Hungarian soil. Before the beginning of the match, the side conducted by Ambros Martin had the goal and the home advantage, however, they struggled against a Hungarian side that looked determined to turn things around. A good performance from Anna Sedoykina under the posts and Lois Abbingh on the attack, took them from a very tight 7-7 to a rather comfortable 15-9 by halftime, with the last goal being score by Anna Vyakhireva, who was making her first appearance on the Champions League after her elbow surgery in February. On the second half, the difference was simply stretched. Efforts by youngster Noémi Háfra, who finished as the best player from FTC and scored a total of 7 goals, were not enough to lift her team. The team commanded by Gábor Elek was finding the right chances against the Russian goal, but were not very effective with the shooting. In the end, the difference was a bulky 33-22 in favor of Rostov Don, who finished the series with a global result of 62-48 and will be back in the Delo Women’s EHF Final 4 after last year’s participation. While the Russian team will be making their second appearance, it will be the fourth consecutive for Ambros Martin, and the fifth in a total of 6 editions so far.